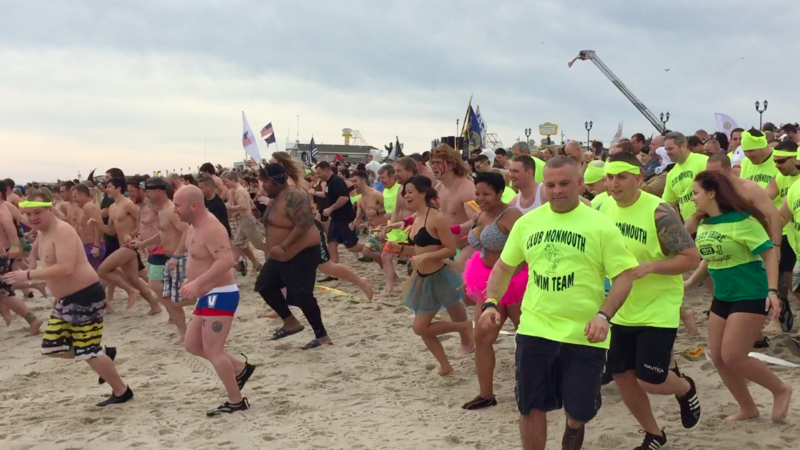 Organizers of the 2017 Seaside Heights Polar Plunge, set for Saturday, estimate 6,700 people will jump into the chilly ocean to help raise funds for Special Olympics New Jersey. The annual event will also draw extra traffic to the island, as tens of thousands are expected to gather to watch the event and partake in boardwalk festivities. The current traffic pattern on the J. Stanley Tunney Bridge, which carries traffic on Route 37 over Barnegat Bay, will not be modified for the event, meaning just one lane of traffic to the island from the mainland will be available. Officials have said travelers should consider crossing the Mantoloking Bridge in Brick to get to the event or take the ride down Route 35 directly into town. Saturday’s Plunge is expected to raise more than $1.7 million, and will take place on the beach between Blaine Avenue and Sumner Avenue, directly in front of Spicy Cantina, located at 500 Boardwalk. Street closures in the area will be in effect until early afternoon. As usual, the plunge itself will take place at 1 p.m. Forecasters are predicting a balmy 59 degrees, but under cloudy skies with the threat of a shower early. Heavier rain and potential thunderstorms are not forecast to move into the area until after the event is over. The ocean water temperature was 43 degrees on Thursday. Participants are required to raise at least $100 for Special Olympics. So far, the highest individual fundraiser is Mike Laverty of Ocean City, NJ, who has raised $25,157. The plunge is organized by the Law Enforcement Torch Run for Special Olympics New Jersey, the largest grass-roots fundraising organization for Special Olympics New Jersey, and is supported by the New Jersey State Policemen’s Benevolent Association, NJ 101.5 and News 12 New Jersey. Walk-up plunge registrants are welcome and encouraged to arrive early due to the heavy traffic – the walk-up registration fee is $125 and the registration tents will open at 9 a.m. Spectators are also welcome. Street and garage parking will be available in the area. More information on the event can be found at its website, www.PlungeSeaside.org.